What is a corporate portal? A corporate portal is a website that contains a company’s internal enterprise-wide information and content accessible to both customers and employees. In a corporate portal, users can access the status of their questions and requests, research the knowledge base and find updated content. Zendesk Guide includes software for creating a corporate portal. Enterprises use Guide to provide centralized information to customers and employees. The goal of a portal is to personalize and deliver information for each user. Companies deploy enterprise portals to provide digital content for external customers and, as an intranet, for internal employees. With the right security software in place, any company can offer content tailored to both audiences from the same site. The main advantage of using portal software is centralization. Employees use the portal as an intranet site for company information and updates. They can access internal drives, folders and files securely through the portal. Customers can use a client login link to search on and check the status of support requests, and to upload and download files securely. By implementing a portal software platform, enterprises can differentiate themselves from competitors with a highly tailored customer resource. Portals can result in a lower expenditure on customer support. Over time, greater personalization translates into increased sales. On the employee side, an intranet improves efficiency and collaboration as enterprise users visit a single enterprise portal for links to other resources and applications within the company. Like an external website, the software behind a portal is infinitely customizable. Most portals become a new development project as companies add technology, business processes, enterprise information and intranet functions that make their portal an attractive, sticky platform. Zendesk Guide lets organizations of all sizes offer their customers and employees the access, solutions, answers and resources they need. 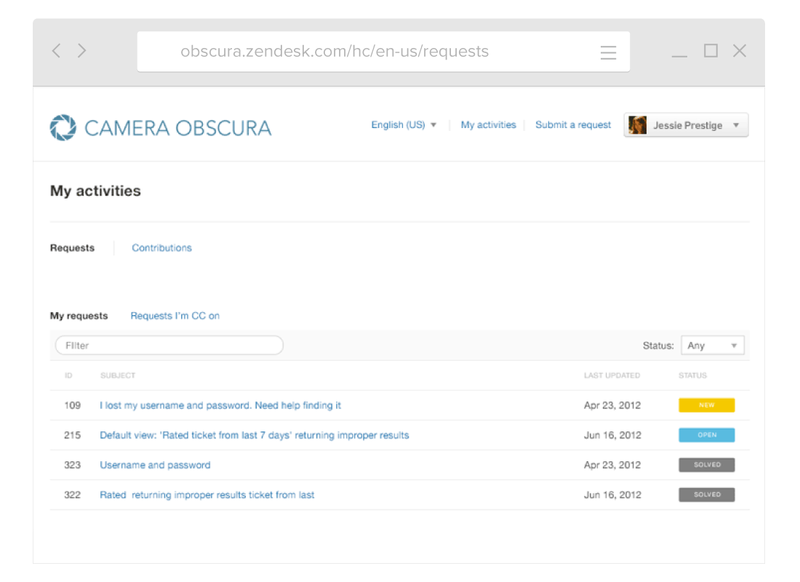 With Guide, external users can search through records of previous interactions as easily as internal employees can. They can find updated content and information on the portal and use it to arrive at their own solutions any time of day. Zendesk Guide provides a comfortable experience for customers, branded to reflect the unique needs and corporate identity of the organization. A corporate portal is a vital component of any great self-service strategy. Learn more about how to help your customers help themselves.